I mark characters I'm gearing as favorites. I only do a handful at a time. They are the only characters i apply gear too till they're done. I don't understand. Like you thought it was a different character, or you just get antsy when you see green crosses and apply them right away? Some completed pieces of gear can be used as is on lesser heroes (cuffs etc). That's when I goof.. It's hell getting old.. Some do not show if a hero they are planned for is not g12, when you look at other heros. I've been told this is a built in defect. It helps boost the chance of having to spend because of an oops. I hope that is nonsense. Also showing something as needed when you have filled that need, it really means it COULD be used. The gear system really needs some polishing. added visual example to OP. I "favorite " who I'm working on. They are the only one I'll gear, unless I'm 100% sure it's not used for a combo G12 piece, and even then, I'll usually save it. Right now I have 3 characters that have the favorite moniker. All G11. This is what I do. Granted, I usually have 6-8 characters favorited because there are so many squads I want to work on, but same basic idea: don't apply gear to anyone who lacks the favorite tag. Sound suggestions, but unless you have looked for your glasses with them on, you just won't understand my dilemma. I think that they should allow you to look at your inventory of unused gear pieces. 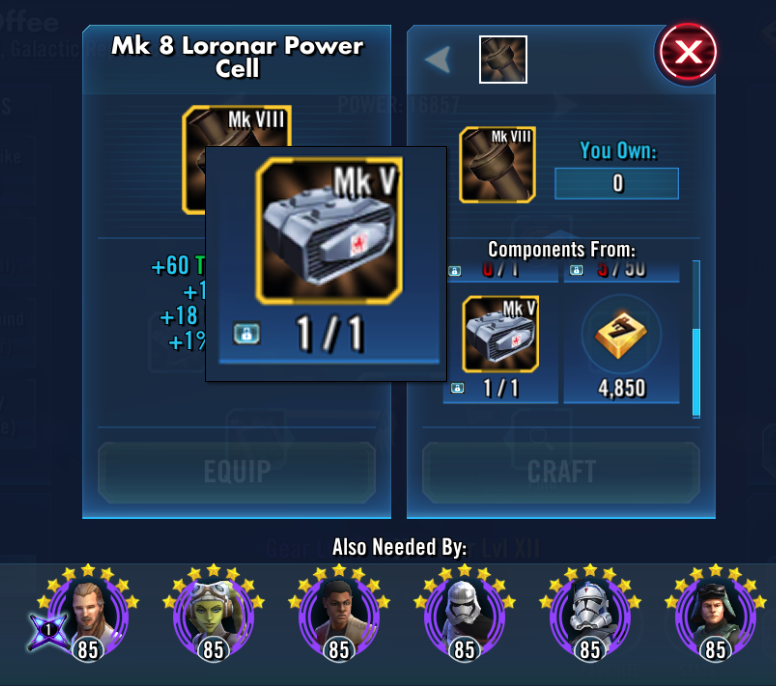 I use swgoh.gg a lot to make gearing choices. Sometimes I don't have a character that currently needs a certain gear piece so I have to bounce around between stores and nodes that offer that gear just so I can see how much of that I do/don't have or need.